This place is incredible if you want to start practicing kitesurfing. La Ventana Bay in the new “it” place of kitesurfing in Mexico. A little fishing town located in the Sea of Cortez, 30 minutes southeast of La Paz, BCS. Locals know this part of the Sea of Cortez as one of the most abundant fishing places in the world. In the town of La Ventana, you will be amazed by the incredible bay landscapes, the Cerralvo island, the scenic sierras, the variety of plants, cactus, the colors of the water and from the warmth of the locals for sure. 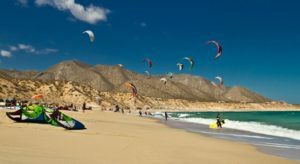 Many kiters from the Staes and Canada travel by car all the way down thru Baja with their RVs to spend the winter months in La Ventana. 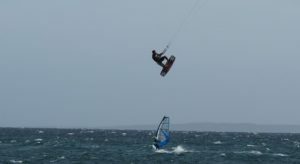 Everything in La Ventana is wind and kitesurfing. 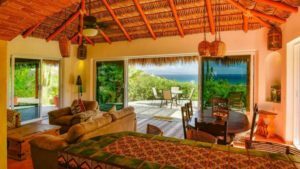 There is a great variety of activities here, from aquatic sports like windsurf, paddle board, scuba, snorkel, freediving, whale and dolphin watch, kayak, fishing, bike rides, hiking or simply relaxing by the sea. As a matter of fact, visibility and clarity of the water is fantastic so you will find plenty of marine life. At night you can join a bonfire at the beach and admire the stars, dine amazing Mexican food in some local restaurant or listen to Mexican music while drinking some beers at Baja Joe’s, Playa central Bar or going to the full moon party at the hot springs beach. Every Tuesday you can buy and eat fresh and organic produce from the local Farmers market and artisans market. Every year, from the months of December, January and march, La Ventana offers international competitions, clinics and expos on kitesurfing, such as La Ventana classic, La ventana windfest, Kite foil Cup and the traditional Expo kite en la Ventana. The international airport of La Paz in the closest one, just 30 minutes from here, and on the other side about two hours is the international airport of Los Cabos. Several international airlines have direct flights to Los Cabos airport. La Ventana was discovered in 1985 approx. by windsurfers and recently has converted in the perfect spot to practice kiteboarding thanks to its stable winds that blow from mid-October thru April, besides the long “L” shaped beach with its sideshore or crossed winds. If you are driving to La Ventana don’t forget to buy your Mexican auto insurance from us! Buy online in just minutes. Full coverage and best prices guaranteed. Next story Cabo Pulmo, the marine paradise for divers. Previous story San Luis Gonzaga Bay: A place to relax and drift away in the calmest sea.